1 Over a low heat in a medium-sized saucepan, fry the onion, garlic and leeks in the olive oil. Cook until soft for about 10 minutes. 2 Add the chicken stock and bring to the boil. 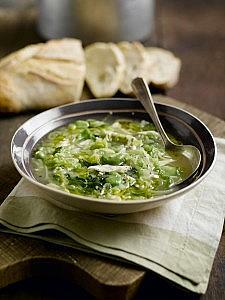 Add the broad beans, savoy cabbage and smoked chicken and cook for a further 5 minutes. 3 Season with salt and pepper. Serve in warmed bowls with extra virgin olive oil and the rustic loaf.